Over the last month, a new meme has spread like a sandstorm across the internet: Looting of antiquities, we’re told, has become “the second largest source of revenue” for the hated terror group ISIS. The claim is almost certainly false, as I explain below. Its provenance can be traced to a State Department-funded archaeologist who is now leading U.S. efforts to protect heritage sites in Syria. The first reference to it came on October 17 in the magazine Foreign Policy, which published a provocative report on the role that antiquities looting plays in funding the Islamic State terror group. Danti’s claim was surprising for those of us who have followed the looting in Syria. The scale of looting is devastating, undeniable and relatively well documented in satellite imagery. But to date, very little reliable evidence has come to light about where those looted objects are being sold, much less the profitability for sponsors of the plunder. I’m not aware of a single object offered for sale in auction houses having been reliably traced back to the conflict so far. And past research shows that the biggest profits in the illicit antiquities trade happen far upstream from the excavators, who take a paltry share of profits compared to middlemen and dealers. Curious about his sourcing, I asked Danti for more information in an exchange on Twitter. Initially, Danti said the claim was based on “in-country sources.” Danti has dug in Syria for years, but did his Syrian sources really have access to ISIS accounting records? When pressed, he referred to “analogies with AQI [Al Qaeda in Iraq] finances,” and pointed me to a 2010 RAND study, Economic Analysis of the Financial Records of al-Qa’ida in Iraq. The study is based on data from Iraq’s Al Anbar province dating to 2005 – 2006. I called Danti last week for more thoughts on the issue. After a lengthy discussion, he asked not to be quoted, saying he would need to clear any comments with the Department of State. (He hasn’t taken that stance in dozens of other interviews.) In essence, Danti said he stands by his claim while acknowledging there is little public evidence to support it. He also noted that as a “dirt” archaeologist, he is unaccustomed to the media attention his recent role has given him, and says he may have been misquoted. 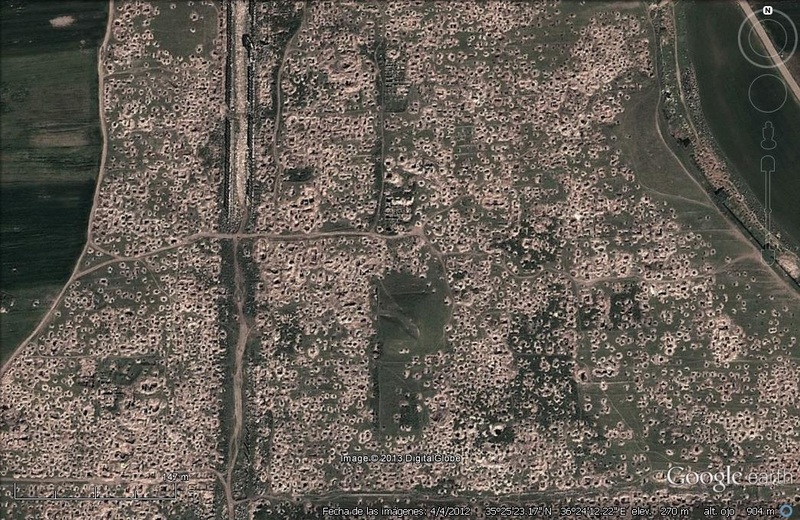 There is no question that looting of archaeological sites has exploded across Syria in recent years, and the satellite evidence is unmistakable. I and others have argued that the various groups involved in looting on the ground — ISIS, al Nusra, Syrian opposition groups, the Assad regime, criminal groups and desperate civilians — would be unlikely to engage in such vast, laborious mining efforts if they weren’t paying off in some way. So, who’s to say Danti’s claim may not be right? Just a week after Danti’s Foreign Policy article, David S. Cohen, the Under Secretary for Terrorism and Financial Intelligence, gave a talk at the Carnegie Endowment describing the U.S. government’s best assessment of the Islamic States’ sources of funding. The assessment is based on intelligence sharing between Treasury, the State Department, the Department of Defense, the intelligence community, law enforcement and foreign governments. 1. The sale of oil from seized fields and refineries, estimated to generate $1 million a day. 3. Sophisticated extortion rackets, which bring in “up to several million dollars per month,” Cohen said. 4. Criminal activity, including bank robberies, stealing livestock and crops from farmers and, yes, looting antiquities. Cohen’s testimony did little to stop the spread of Danti’s “second biggest source” meme. On Oct 27th, the claim was repeated by the U.S. Naval Institute in a article written by a retired brigadier general and two terrorism finance researchers at the Monterrey Institute (“How ISIS Funds Terror Through Black Market Antiquities Trade.” Soon after, in an op-ed for Al Jazeera, Stephennie Mulder, an assistant professor of Islamic Art and Architecture at the University of Texas at Austin, repeated the claim. (She had it removed from the article after Danti’s sourcing was brought to her attention by other experts.) On Nov. 6th, Newsweek reported it again. Danti is hardly the first to speak beyond the available evidence. I have spoken with imprecision about the link between terrorism and the antiquities trade. UNESCO officials frequently cite a $7 billion dollar figure for the global illicit antiquities trade that has a very shaky foundation. The Antiquities Coalition has referred to $3 – $5 billion generated by looting in Egypt alone since 2011 (or in some instances, per year), but the research supporting that claim has yet to be published. Rajendra Abhyankar, a professor at Indiana University and former Indian Ambassador to Syria, declared in the Huffington Post earlier this month that “thirty to fifty percent” of ISIS income comes from the theft and looting of antiquities. When asked for a source, he told me it was based on notes he had taken while reading articles that he could no longer find. 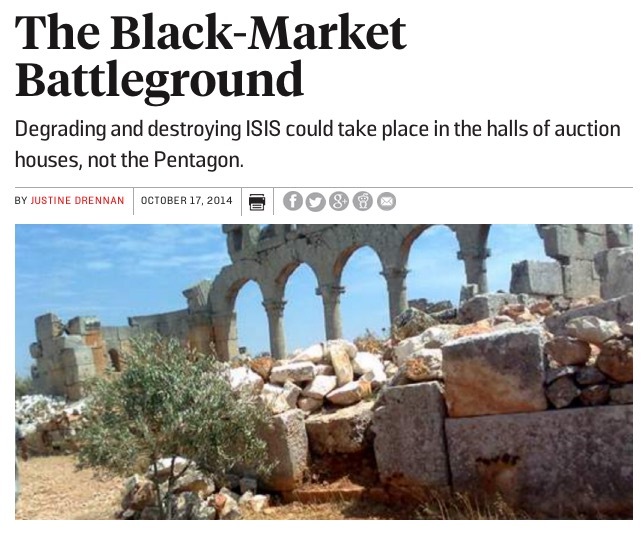 (I’m now told Abhyankar relied in part on this story in Al-Monitor, which states, “Some even say the looting of historical artifacts has become the Islamic State’s main source of revenue…”) The problem is significant enough that Dr. Sam Hardy at Conflict Antiquities has made a cottage industry of debunking such claims. This is particularly true, and troubling, when baseless claims come from a highly respected academic group being paid — and held out as the gold standard — by the State Department. When John Kerry gives a speech about looting at the Met, he is using the issue to help justify the escalating U.S. military intervention in Syria. In that context, it is more important than ever to stick to the known knowns.